Advent Books was established in 1994 by Jonathan Bennett at the age of 16. 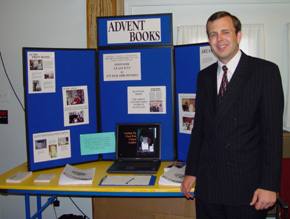 Advent Books was established in 1994 by Jonathan Bennett at the age of 16 from these early days God has expanded the work in a big way, reaching millions of homes, sending out thousands of books and Bible Studies. In 1996 our first bulk mailing went out to 3,518 homes. At the time it was a great leap for Advent Books but now 10 years later it looks like a small step in comparison with over 1 Million being sent out in 2013. We always believe in getting the right tools to do the job at Advent Books; this is why in 1997 we bought our first printing machine and as we expanded and sent out more leaflets, we bought more printing machines until we now have a total of 5. At first we ordered copies of The Great Controversy books from the local Seventh-day Adventist printing house in quantities of hundreds then in thousands. Nowadays we order at one time 50,000 copies of The Great Controversy books to be printed. It is grand to see them being sent out to people requesting them after reading the Great Controversy leaflet. From the small beginning until now, over 21 million homes have now been reached and 31,000 copies of The Great Controversy have been sent out. Praise God for this. A great work has been done but so many more souls need to receive the truth. By April 2013 nearly 79% of Great Britain will have been covered. To put that in perspective, that is as if the whole of Australia has received a leaflet or as if every home in Denmark had received a leaflet 5 times. We thank God that now over 15,600 people have also requested the postal Bible lessons which are sent out by another ministry. Praise God for this but keep praying for the work. People are coming to the truth. The Holy Spirit is convicting people and they are being baptised. You may be reading this and thinking God is certainly moving the work forward in Great Britain and this is true but as the saying goes we have only just seen the tip of the iceberg in front of us. Click here to download an online PDF file of the History of Advent Books.